Performers include: Enrico Colantoni, Hugh Dillon, Michael Cram, Sergio Di Zio, Mark Taylor, Amy Jo Johnson, David Paetkau, Ruth Marshall, Pascale Hutton, Jessica Steen, Tattiawna Jones, Bill MacDonald, Tyler Stentiford, Janaya Stephens, Lisa Marcos, Philip Akin, Gabriel Hogan, Danijel Mandic, Matt Gordon, Tim Dutaud, Stephanie Morgenstern, and Cheyenne Freitas. This drama series details the lives of the Strategic Response Unit (SRU), a special force that is called on in severe situations that are too intense for regular officers. 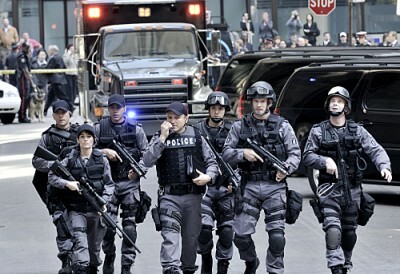 Based on the real-life Emergency Task Force of Toronto, Canada, the expert cops are often called upon to rescue hostages, dissipate gangs, negotiate with kidnappers, investigate bomb threats, and talk down possible jumpers. While the SRU is heavily armed and specially trained, their real assets are their expertise in dealing with human emotions. The team explores the “flashpoint,” or the critical point that has suddenly triggered a person into action. Sergeant Gregory Parker (Enrico Colantoni) leads this talented team of officers. His team looks up to him as a father figure, and he is gifted with an innate ability to read people. He’s been practicing since he was a young boy when he had to predict whether his father was about to hit or high-five him. On Parker’s team are charismatic Ed Lane (Hugh Dillon), who is addicted to his job; observant Julianna “Jules” Callaghan, a former Royal Canadian Mounted Police; Mike “Spike” Scarlatti (Sergio Di Zio), the rebellious “little brother” and rookie of the team; sniper Sam Braddock (David Paetkau) who is smitten with Jules and was formerly a member of a military counter-terrorism task force; former troublemaker Lewis “Lou” Young (Mark Taylor), a street smart gang expert; gentle Kevin “Wordy” Wordsworth, a man driven to keep the streets safe by the love of his children; and forensic psychologist Dr. Amanda Luria (Ruth Marshall), who is able to get to the truth by using her sense of humor. The members of Team One have no time to mourn the loss of Team Three leader Donna Sabine and one of her colleagues following the explosion of suspect and psychiatrist Anson Holt. The team learns that the perpetrator is actually Marcus Faber. He is one of Holt’s former students and a victim of his sadistic experiments. Team One races through Toronto to defuse all of the remaining bombs. Greg Parker attempts to disable the last bomb in the catwalks of Fletcher Stadium and is twarted by Faber. A gravely injured Parker succeeds in diffusing the bomb and Ed Lane saves his life by fatally shooting Faber. One year later, we find that Greg has retired to teach at the police academy. Spike and Winnie are officially a couple. Sam and Jules have their daughter, Sadie. Sam is the new leader of Team Three and Ed is promoted to Sergeant. What do you think? Do you like the XXXXXX TV series? Do you think it should be cancelled or renewed for another season? Discovered FLASHPOINT just a couple of months ago.. Absolutely LOVE LOVE LOVE THIS SHOW!!!!!! BEST ACTION SHOW I HAVE EVER SEEN!!!!! PLEASE PLEASE PLEASE bring it back!!!! With original CAST, of course!!!! FANTASTIC ACTORS!!!!!! Sorry I didn’t watch this show when it was on, but I love love it. Wow I wish it would come back. loved this show and will really is it. Is there any way to get it back on?